The first month of Autumn is almost over, the weather has been mild, not too cold but slightly warm. However, we need the rain badly, the soil is dry, very dry in fact, it is not encouraging for the garden. I notice my flower bed is growing very slowly, we have enough sunshine but not enough water for the ground. By saying that, I am so lucky that the self-sown pumpkin in the garden is growing alright, three pumpkins are growing bigger by days. Two of them at least will make it for harvest. I believe they are ready to be picked in a couple of months. Pumpkins keep well on the storage but knowing me, love to cook them straight away or share in pieces with friends. What I would do with the homegrown pumpkin is for cooking, baking and roasting. Pumpkin soup I cooked in the past, and also pumpkin cake, mini cakes and scones. Roast pumpkin I do to complement the roast meat is a winner for my family. Another pumpkin that I cooked was a baked of the whole pumpkin, cut in a half used for a plate to serve peas, and also rack roasted lamb. I love to share the recipe of the mini pumpkin cake with you, here it is. 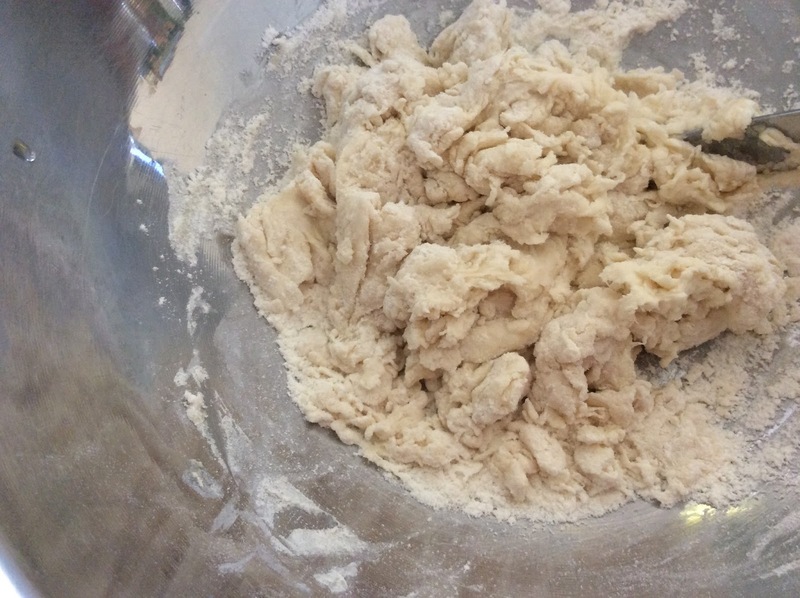 Use a blender or food processor, blend and process the ingredients together to make a smooth and thick batter. 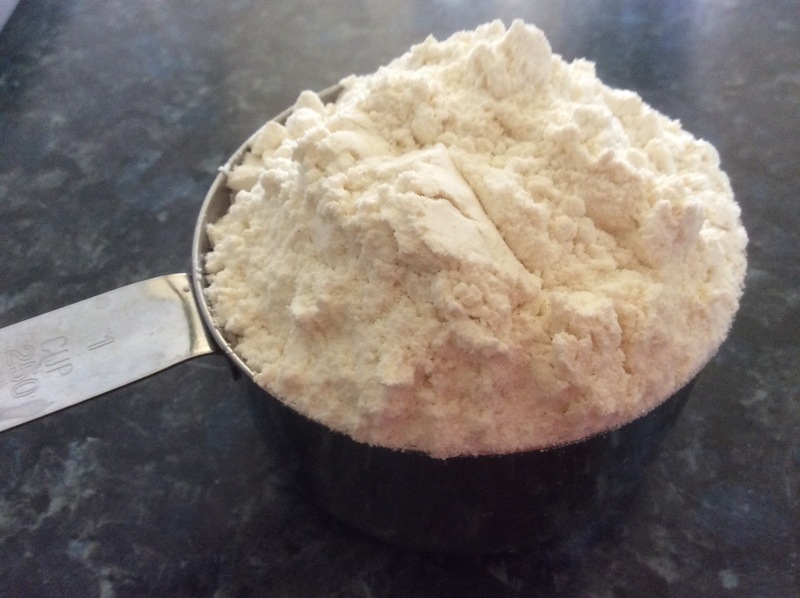 If it is too thick adjust it by adding more milk. When it is cold fill in with pumpkin jam and whipped cream. The fresh herb is essential for me, love to have them in my cooking and use them for garnishes. At the moment the herbs are looking good in my garden. Pumpkin is a very versatile vegetable, you can do so much with it. 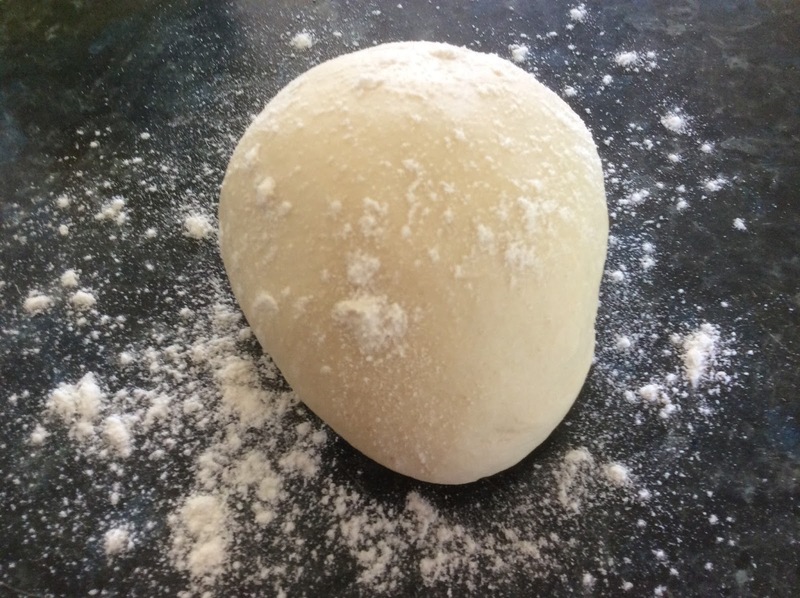 Hope you like my cooking using the pumpkin, enjoy the recipe and happy cooking. We visited Rome while ago, and I am so fascinated by the beautiful tree and the name is Pine Stone. The leaf is so green, and the shape of the top tree is broad and roundish that resemble the umbrella – a beautiful canopy. We saw these trees closely in the Papal garden. Love to call the tree the Pine of Rome. The only souvenir I would like to have was to take one of the trees homes and plant it in the backyard. Of course, it’s impossible, in fact, I could not get to buy any seedlings. Just as well, according to the literature, I read the Pine stone can grow very tall and also take a long time to be mature. No, it won’t be any good to have it in my backyard. To reminisce about the beauty of the Pine of Rome is to see it through my cooking. It is a challenge for me, how I go about it and how do I have to deliver it. I have to create the leaves, the branches, the trunk and the fruits. Here it is, it worked well and indeed the Pine of Rome looks absolutely gorgeous. Often the Pine of Rome standing in a row that makes a beautiful site. It’s a delicious vegetarian dish was created and enjoyed by the family. 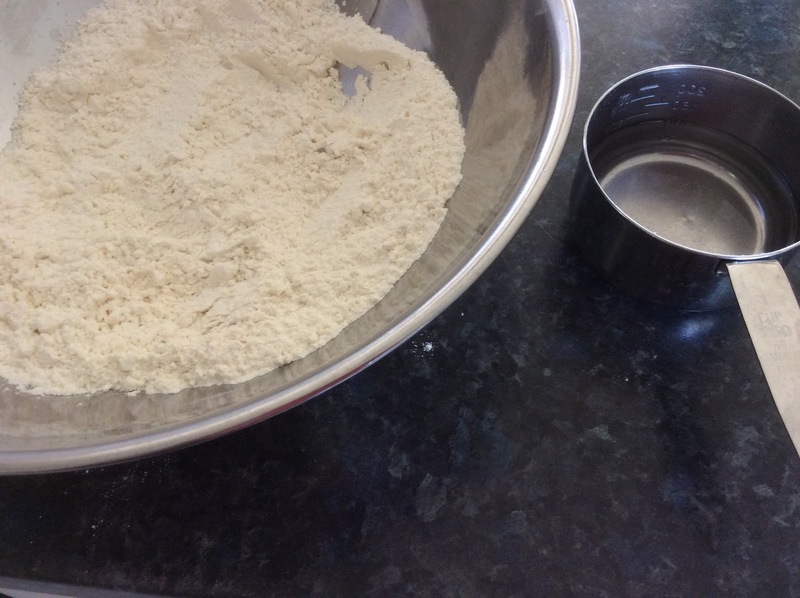 The batter was so light, fried salpicon was soft and the leaf was crunchy. 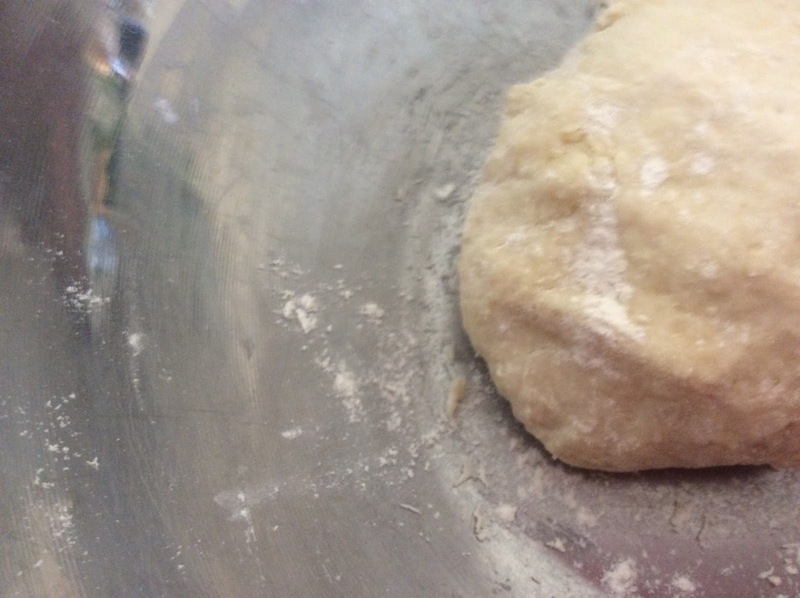 It’s a success in cooking. The plant in the backyard is doing so well this year, harvested fruits and they are large enough for their size, the taste also has improved from last year it’s less bitter, and sweeter. To Use and To Serve Pomelo. Eat it fresh, or add in a fruit salad. The sweet and sour taste is good to go with fish dishes. Pomelo salad with Prawns and Mango, Delicious! Fresh pomelo meat is delicious to eat after the main meal, to clean the palate. The pith is excellent to preserve in sugar syrup or crystallized with sugar. Pomelo Mini Cake is a Treat. A sweet and a creative post, how do you like it? It is good to grow tomato plants in any backyard garden. 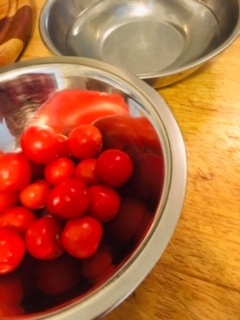 I have self-sewn cherry tomato this year, the harvest was not plenty but enough for us. 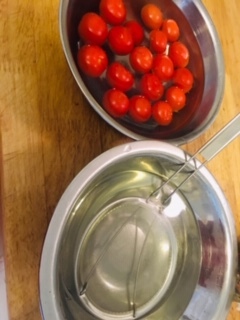 We eat them as salads, and for cooking, but some of them used as tomato concasse and here it is, I will show you how to do it. Soak in hot boiling water, for one minute for easy peeling. 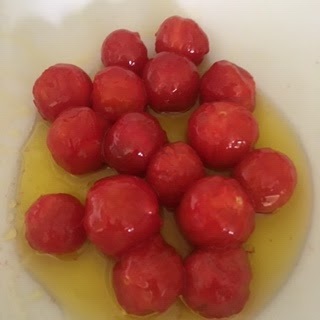 Score each tomato before putting into hot water and drain to transfer to cold water. Peel the tomato immediately. 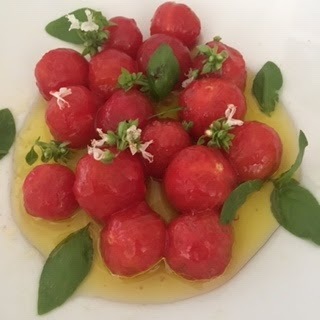 Use the tomato for the base of sauces, and for other garnishes. 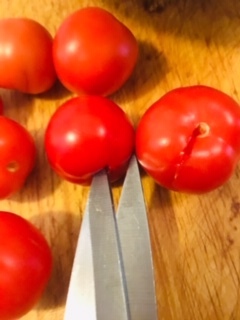 Use a pair of scissors to score the tomatoes before putting in hot water. I serve it for salads, add into pasta dishes, or chopped up to make tomato soup or tomato sauce. You could discard the seeds before using the tomato if you wish. 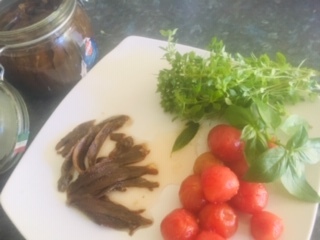 Ingredients that readily available in your pantry and cannot afford not to have are anchovies, pasta, olive oil. To serve the pasta, you don’t need any cheese. 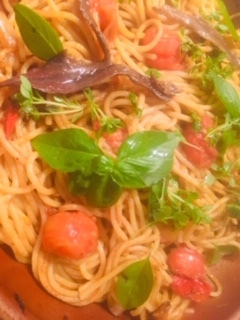 Using tomato concasse to add to pasta. 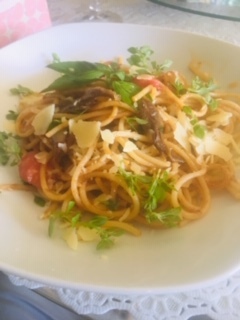 From the pantry: anchovies, capers, olive oil, add the concasse tomato, fresh herbs to cooked pasta to make a delicious pasta dish. Delicious meal and easy preparation. 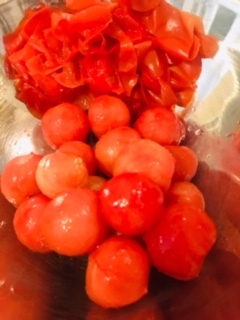 You can make lots of tomato concasse using large tomatoes and cherry, place in a clean jar, refrigerated for healthy keeping. It could stay there for a few days. Happy Harvest Day for You All. Have fun of making the Tomato Concasse.